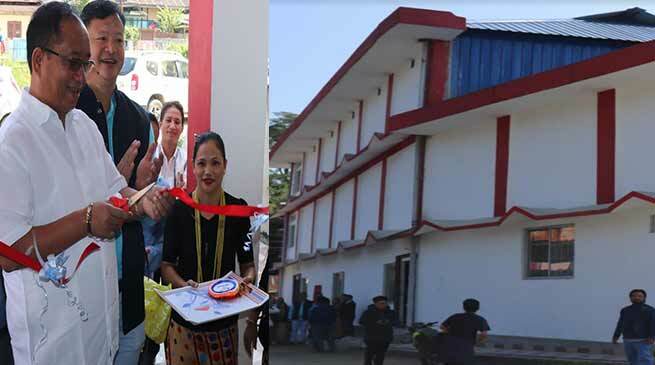 Itanagar MLA Techi Kaso inaugurates Techi Takar Multipurpose community hall. The Itanagar local MLA Techi Kaso inaugurated the Techi Takar Multipurpose community Hall constructed at a cost of 4 crore at G Sector. Earlier the old hall was demolished and the fund for the construction of a new hall was allocated by the former chief Minister Late Kalikho Pul. Addressing the inaugural function of the Community Hall, Kaso said that the Hall should be beneficial for all the badminton players of the township. While remembering Late Techi Takar, Kaso said that Late Takar was a cabinet Minister of state and was a prominent figure in the society. Phassang also urged people not to forget the contribution made by the former Chief Minister Later Kalikho Pul for construction of Techi Taker Multipurpose Community Hall and other infrastructure development of G-Sector. While recalling the history with Techi Takar Community Hall , Phassang said ‘ this hall has witnessed the state politics where a makeshift assembly was held and its a history now. Kaso while responding to the memorandum submitted by the locals assured to allocate required funds for Water plant in the area. G Sector welfare committee President Solung Tajo among other also address the gathering. Special invitee Naharlagun Mandal President TK Tagru, social worker Taro Tagia among others were present on the occasion.